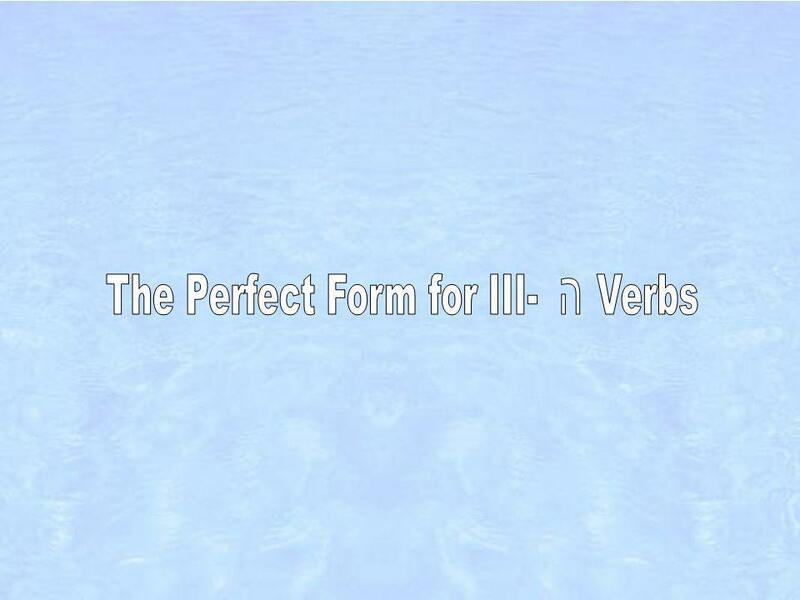 The changes in the III-ה verb form are extensive and require careful consideration to understand and translate. PNGStandard III-ה 3ms קָטַלגָּלָה 3fs. 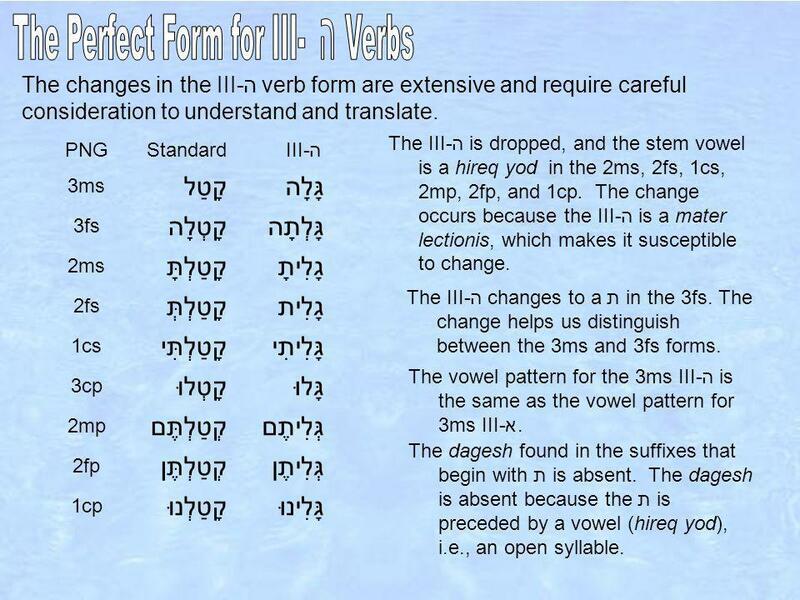 2 The changes in the III-ה verb form are extensive and require careful consideration to understand and translate. PNGStandard III-ה 3ms קָטַלגָּלָה 3fs קָטְלָהגָּלְתָה 2ms קָטַלְתָּגָלִיתָ 2fs קָטַלְתְּגָלִית 1cs קָטַלְתִּיגָּלִיתִי 3cp קָטְלוּגָּלוּ 2mp קְטַלְתֶּםגְּלִיתֶם 2fp קְטַלְתֶּןגְּלִיתֶן 1cp קָטַלְנוּגָּלִינוּ The III-ה is dropped, and the stem vowel is a hireq yod in the 2ms, 2fs, 1cs, 2mp, 2fp, and 1cp. The change occurs because the III-ה is a mater lectionis, which makes it susceptible to change. The III-ה changes to a ת in the 3fs. The change helps us distinguish between the 3ms and 3fs forms. The vowel pattern for the 3ms III-ה is the same as the vowel pattern for 3ms III-א. The dagesh found in the suffixes that begin with ת is absent. The dagesh is absent because the ת is preceded by a vowel (hireq yod), i.e., an open syllable. 3 Some verbs have more than one weak verb characteristic. Note the vowels of a III-ה verb that also has a I-guttural consonant: עֲלִיתֶם You (mp) went up. עֲלִיתֶן You (fp) went up. The verb הָיָה is also doubly weak. 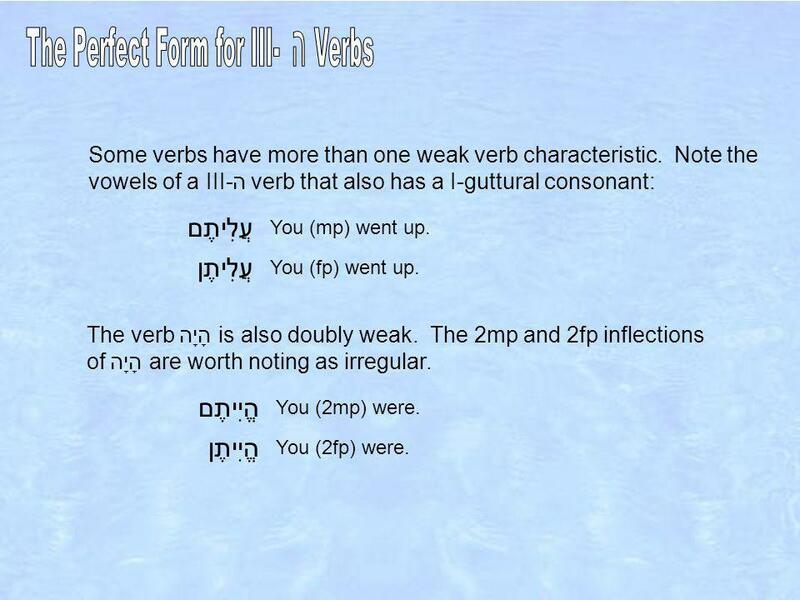 The 2mp and 2fp inflections of הָיָה are worth noting as irregular. הֱיִיתֶם You (2mp) were. הֱיִיתֶן You (2fp) were. 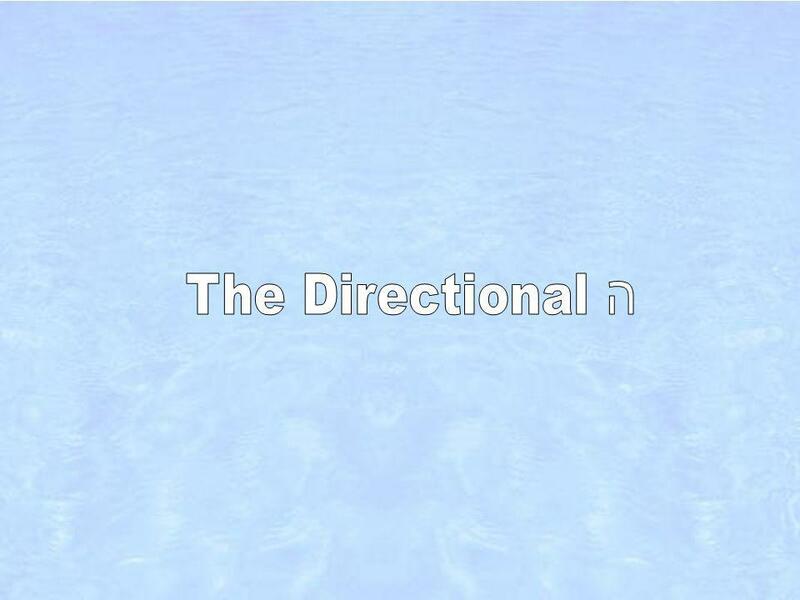 6 The directional ָה can also be used to indicate directions. For example: צָפוׁן north צָפוׁנָה northward תֵּימָן south תֵּימָנָה southward קֶדֶם east קֵדְמָה eastward יָם west יָמָּה westward Finally, the directional ָה can be used on adverbs to indicate direction. 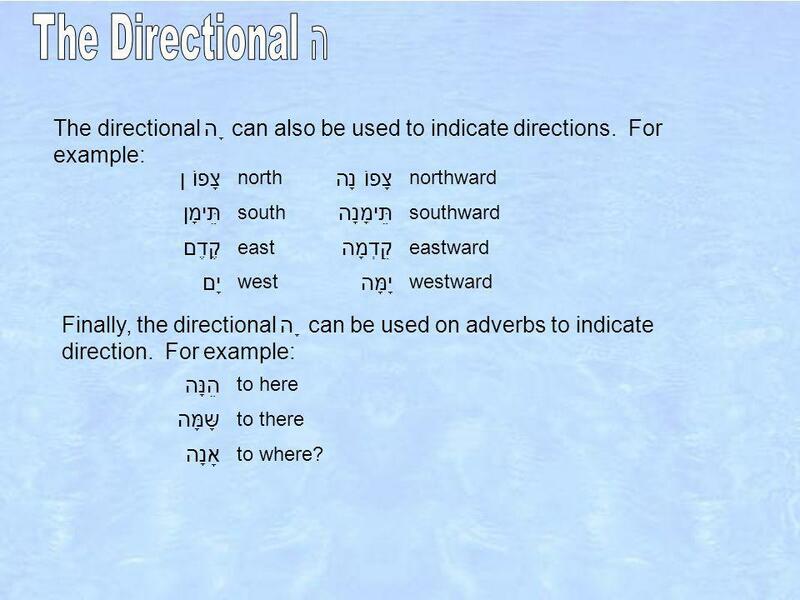 For example: הֵנָּה to here שָּמָּה to there אָנָה to where? Download ppt "The changes in the III-ה verb form are extensive and require careful consideration to understand and translate. PNGStandard III-ה 3ms קָטַלגָּלָה 3fs." 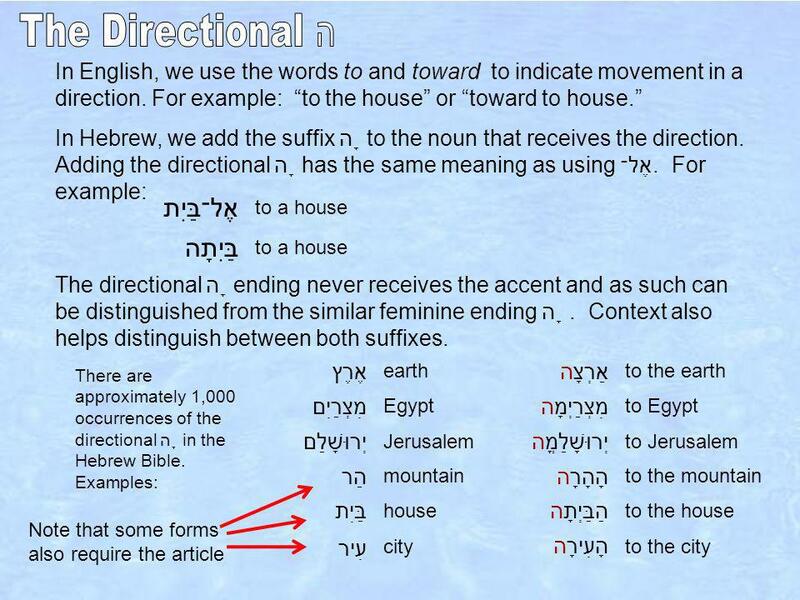 Berachah Bible Institute Hebrew Grammar I Chapter 9: Hebrew Pronominal Suffixes. A geminate is a word that has identical second and third root consonants, such as סָבַב and אָרַר. In several of the perfect verb forms, the first twin. Spanish nouns A noun is a word used to identify people, animals, places, things, or ideas. Unlike English, all Spanish nouns, even those that refer to. Each Hebrew word has a three-consonant root. Hollow verbs have a medial (middle) ו or י, such as בוא, שׂים, צום, קום, מות, בושׁ, and רוץ. These verbs. I-Yod: Imperfect and Related Forms. The two verbs יָשַׁב and יָרַשׁ represent the changes that occur when I- י verbs are converted to the imperfect inflection. 1 Consolidating the Strong Verb Consolidating the Perfect A. Three Variations for the Perfect 1. No sufformative — 3MS 2. Vocalic sufform.— 3FS, 3CP. Final stable syllable -tion	-sion. In Hebrew, we express possession by adding a pronominal suffix to a noun. The suffixes are similar to those for prepositions that you studied in lesson. 1. The Infinitive Absolute is a verbal noun. Like the Infinitive Construct, the Infinitive Absolute is not inflected for person, gender, or number – so.